In a blatant plug for the Reagent Guide, each Friday I profile a different reagent that is commonly encountered in Org 1/ Org 2. Today’s reagent is among one of the best and most useful at what it does in all of organic chemistry. It’s blindingly good, in fact. So blinding, I don’t know if I’ve ever seen an example of it being used in an undergraduate teaching lab. It’s not a reagent for rookies: it’s genuinely dangerous, and best handled with extreme care. Osmium tetroxide (OsO4) is a volatile liquid that is most useful for the synthesis of 1,2 diols from alkenes. (Side note: another name for 1,2 diols is vicinal diols, or vic-diols). The reaction is very mild, and usefully leads to the formation of syn diols. Another side note: this reaction doesn’t work with alkynes. The reaction works through a concerted process whereby two oxygens from the osmium interact with one face of the double bond. This results in a 5-membered ring (called an osmate ester) and generates the syn stereochemistry. The osmate ester is broken up into the 1,2-diol by use of a reducing agent such as potassium bisulfite, KHSO3. This is frequently omitted in textbooks, but is worth mentioning just in case. By the way, dihydroxylation of alkenes can also be performed with cold, dilute potassium permanganate (KMnO4). One advantage of OsO4 is that it is much more compatible with other functional groups than KMnO4, which is kind of a ravenous beast. What do you think would happen if the vapors from OsO4 reached your eyes? Everything would go dark, let me tell you. The good news is that apparently the blindness wears off after several months. P.S. You can read about the chemistry of OsO4 and more than 80 other reagents in undergraduate organic chemistry in the “Organic Chemistry Reagent Guide”, available here as a downloadable PDF. P.P.S. One preparation in Woodward’s synthesis of cortisone (subscription req’d) calls for Osmium tetroxide (68.48 g) . Damn!!! You can make the use of OsO4 catalytic if you throw in a sacrificial oxidant, N-morpholine oxide (NMO). I’ve had several lab mates use catalytic NMO without incident. Oh yeah. My point (perhaps not so well made) was that undergraduate teaching laboratories are unlikely places to learn how to use OsO4. But maybe there are places out there who do? Your point brings up another question – I”m wondering how many instructors include NMO when they teach the dihydroxylation reaction. I’ve worked with students from dozens of schools, and I can’t find another of an example of an instructor who does (although Jim Tour teaches cat. OsO4 and H2O2). You, my good man, are one of the very few! Good on you. They do where I go to college (Uni. of Minnesota). My prof mentioned using NMO because OsO4 is ridiculously expensive, and NMO turns it into a catalyst so you don’t need as much. She failed to mention the burning out the eyes part, though. A friend of mine once had to do a reaction with 10 mL of OsO4. Insane. NMO is in McMurray, 8th Edition (used by 1 of 3 sections at SUNY Geneseo). Wow, I had no idea it’d ever been used on that scale in a synthesis! Unfortunately for those guys the Upjohn catalytic procedure wasn’t reported until 20 years later. I seem to remember that Kumamoto’s synthesis of methyl-kinamycin C and Corey’s neotripterifordin also use it stoichiometrically, although not on anywhere near that scale. I once saw the selective dihydroxylation of one bond in a 1,4-cyclohexadiene reported in a very old Tet. Lett. using stoichiometric OsO4. 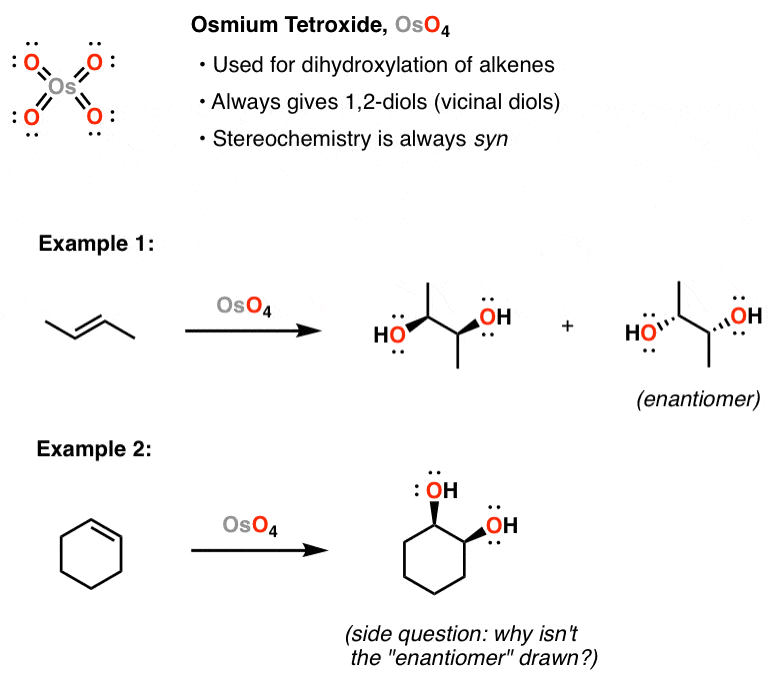 When I tried it with NMO as the terminal oxidant aromatisation was a major problem so I changed my route. I never had the courage to try with the 1.1 equiv. reported so I’ll always wonder if it would have worked. If nothing else, OsO4 is also damned expensive (~300$/g from Aldrich). At the university where I currently am (I can tell you it’s in the UK, if you couldn’t guess from my spelling) 3rd year undergrads get to do Sharpless AD, although obviously that’s with potassium osmate, which is far less volatile/nasty. Still, they do generate OsO4 during the reaction, and they only have to quench it wrong (which is not impossible) for potentially bad things to happen. I get very nervous when this experiment runs. Wow! Sharpless AD in 3rd year? That’s fantastic. The AD-mix makes it pretty easy I guess. Kudos to your school. In the “advanced organic chemistry” labs I’ve been in or TA’d, there’s always seemed to be a fine, 30-year or more patina of dust on the procedure we were using. Nothing wrong with that per se, but it didn’t give you the exciting feeling of doing something cutting edge. What happens when diol reacts with OsO4? Why isn’t the stereoisomer for the cyclo hexene drawn (side question)? I feel like the answer’s at the tip of my tongue but I can’t quite get it. It’s a meso compound. It has a plane of symmetry and is thus an achiral molecule. Well done with Master Organic Chemistry. It is clean, simple, and useful. Hi, just wondering in what cases does OsO4 fail? Certain alkenes? What about enones (I’ve seen that it does some enones but wondering if some cases would fail)? And how are the reactivities between OsO4 and K2OsO4 differ, besides the latter having hydrates and not useful for moisture sensitive reactions? Thanks! What is the effect of H2O2 on the action of OSO4? Hey thanks for all your help and dedication to furthering education. Really appreciate your help with making these pages. Between this and the people at Clutchprep I’m acing organic chem and can’t wait for orgo II, bio chem, and pharmacy school next august. How exactly does the H2O2 hydrolyze the intermediate 5-member ring? Does it donate a proton onto the Oxygen involved in the C-O bond? If so, why would the oxygen want to form that O-H bond instead of remaining with the rest of the ring? I do not believe that products in Example 1 are meso compounds that result from the syn addition. They certainly look like the products of anti-addition. Both -OH groups should be either wedged or dashed, if added on the same side. Here they are the same but on different sides. If you rotate, they definitely look like the products from anti-addition (the example on hydroxylation of a linear alkene). Hi, it doesn’t say that they are meso compounds in this specific example, it says they are a mixture of enantiomers. However, what about example 2?